Karuizawa Guide Service (KGS) is engaged in tour guide business, translation and English school based in Karuizawa of Nagano, Japan. Broad portfolio of private / group English lessons based on the experience and knowledge of the real business world. We send English-speaking tour guides to private groups (individual customers as well as organizations). 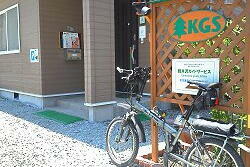 We can guide Nagano Pref. as well as other places than Nagano. You can see photo albums that show actual guided tours. We provide high-quality interpreting and translation services to corporate and individual clients (Japanese / English). Kindle-/paper-edition books from KGS, including the Amazon.co.jp bestseller "English Guidebook of Karuizawa." Karuizawa-based group which shares information and does activities with regard to international events and English. Why don't you join us? Introducing KGS's students, customers, KGI members, etc. How to contact us, community activities, and information about KGS. 「View on Twitter」をクリックするとツイートが別画面で表示されます。原則ツイッターでの返信はできませんので、お問い合わせはこちらからお願いします。Please contact us from here as we can not reply on Twitter basically.